During the 17th and early 18th centuries, pirate ships threatened ships that traveled the waters of the Caribbean. Pirates still exist, and sometimes they still threaten ships, such as those pirates that operate off the coast of Somalia. However, there are other pirates who threaten another valuable target, the fish of the seven seas. I don't think the average person understands the vast scope of this piracy problem, and the harms that it causes. I previously wrote about the problem of piracy and the Patagonian Toothfish, aka Chilean Sea Bass. Pirates were decimating the population of this species, caring only about the money they received for the fish. Fortunately, united efforts were successful in combating this dire threat and now it is a relatively minor issue. Toothfish is but a single example of the many species that face peril, illustrative of the general threat posed by these pirate fishermen. Officially, pirate fishing is referred to as Illegal, Unregulated & Unreported (IUU) fishing. How widespread is this problem? Is it a large enough problem that warrants our action? In an upcoming issue of Marine Policy (September 2014), a thought provoking study will be published, Estimates of Illegal and Unreported Fish in Seafood Imports to the USA, authored by Ganapathiraju Pramod, Katrina Nakamura, Tony J. Pitcher and Leslie Delagran. Their stunning conclusion is that from 20% to 32% of wild-caught seafood imports to the US come from IUU fishing. That is astounding and should concern us all. This is also a problem faced all across the globe, and not just in the U.S. These pirate fishermen ignore laws and restrictions on where they can fish, what they can fish, and how much they can fish. All they are concerned with is maximizing profits, ignoring whatever harms they cause in the process. They pose a danger to threatened species, which may be overfished and which laws have been instituted to protect. They pose a danger to the environment of the sea, to marine ecosystems, by using illegal gear which can harm the bottom of the sea, destroy reefs and much more. They hurt the livelihood of legal fishermen, who operate within the bounds of the law. This is the poaching of the seas and needs to be stopped. Why does so much of this IUU seafood enter the U.S.? The difficulty in tracking this illegally acquired seafood is due to an often incredibly complex supply chain which allows multiple occasions when such illegal seafood can be snuck into that chain. This is especially true when seafood is processed post-harvest, in a different country from where the fish was first obtained. All of the various middlemen and post-harvest travels are ample opportunity for illegal obtained seafood to be "laundered," like illegal money. Currently, the U.S. government doesn't do enough to stop this importation of IUU seafood. The Lacey Act, which has been in existence for over 100 years, provides a mechanism to punish those engaged in the trade of IUU seafood. However, you cannot reach the point of punishment until you first detect that such IUU seafood exists. And in that respect, the U.S.'s efforts are insufficient. A tiny portion of seafood imports, maybe only 2%, are inspected, but that is more for food safety and species identification rather than checking whether it is illegal or not. As such, plenty of IUU seafood is going to continue entering the U.S.
A primary solution to this problem is more traceability in the seafood supply chain, being able to determine exactly the chain of custody so you know exactly the source of the seafood. We need to be able to determine the precise source of all seafood entering the U.S. as well as determine everywhere that it travels before it reaches the U.S. The government should take steps to require traceability from all seafood that enters the country. Consumers should demand traceability in the seafood they consume. Traceability is a hot topic in the seafood industry and it is becoming more and more common, but there is obviously much more that needs to be done. I should also note that a contributing factor to this entire problem is that the U.S. currently imports a disturbing 91% of their seafood. Consumers need to purchase and consume much more local seafood. That should help to decrease the amount of IUU seafood that enters the U.S. Though IUU fishing does occurs within the U.S., it is to a much smaller degree than it is internationally and the U.S. is better able to combat and monitor the problem. So, rather than roll the die on imported seafood, which could be IUU, choose local. Pirates have been a scourge of the seas for many centuries, and we still need to unite to combat them. 1) The Chefs Table Foundation and The Jamaica Plain Tuesday Club, both non-profit organizations, have partnered to bring the Neighborhood Cooking Tours of Jamaica Plain, a culinary tour of Jamaica Plain. The Chefs’ Table Series TV Show will film the chefs of four restaurants teaching a live audience how to cook a delicious dish. Proceeds from each cooking tour will benefit the non-profits. These events will take place at the Loring-Greenough House, at 12 South Street, Jamaica Plain. Guest will watch co-host & trained chef Joe Murphy cook along with the featured chef of the week, enjoy a wine pairing, tasting of the chef’s dish, and be part of a live studio taping of The Chefs’ Table Series. A raffle will also be part of the festivities. Menus will be announced on website. Tickets are $40 per person, and must be purchased in advance. There are no food substitutions. All guests must be in their seats by 6:15pm. All electronic devices must be turned off so not to interfere with the sound and filming of the show. It is estimated that the taping of the cooking segment, wine pairing, opening of the show, and guests enjoying wine and food will be 2 hours the most. Tickets can be purchased by visiting: http://www.tablecritic.com/neighborhood-cooking-tours-in-jamaica-plain/ or by calling 617-323-0670. 2) On June 10, at 6:30pm, Legal Sea Foods in Park Square will host a wine dinner with Sonoma-Cutrer. Since the vineyard’s inception in 1973, Sonoma-Cutrer has been producing wine. Its foundation is built in the hillsides and rocky foothills in the region recognized as the Sonoma Coast Appellation. The region experiences long, even growing, seasons thanks to the cool, foggy coastal climate. Today, Sonoma-Cutrer’s flagship wine, Russian River Ranches, is one of the most requested Chardonnays in America. There are approximately a dozen or so books, available in English, about Sake and many of them are very similar. They provide basic information about Sake and also give some Sake recommendations. Sake articles in magazines are uncommon, and most provide only basic knowledge about Sake, introductory primers to educate consumers. It is more difficult to find advanced information about Sake, information that goes beyond the basics and generalities. Fortunately, a new book has just been published which addresses this omission. 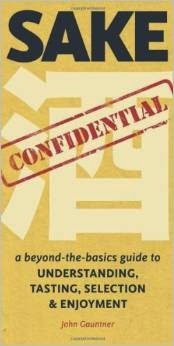 If you have any interest in Sake, then you should check out Sake Confidential: A Beyond-the-Basics Guide to Understanding, Tasting, Selection, and Enjoyment (Stone Bridge Press, May 2014, $11.95) by John Gauntner, the famed Sake expert and Sake Dendoushi ("Evangelist"). This is a trade paperback book of 184 pages, divided into three parts: Sake Secrets, How The Industry Really Works, and The Brewer's Art Revealed. The book begins with a 14 page Introduction, which is a basic education about Sake, relying on numerous generalities to get across the message. After the Introduction, you will find over 24 chapters, covering a broad array of more advanced Sake topics. Though this book deals with more advanced Sake topics, it is well written in an easily understood manner so that it will appeal to readers of any knowledge level. You do not even need to possess a foundation in Sake to appreciate this book as the Introduction provides you all you need to progress to the more advanced topics. I previously attended John's Sake Professional Course and found him to be an excellent and engaging instructor, and that comes out in this new book. John shares his extensive knowledge of Sake, going beyond the generalities many know and breaking down some of the myths and misconceptions about Sake. In the first section, Sake Secrets, John goes into greater detail about Sake types and styles such as Junmai, Namazake, Ginjo, Kimoto, and Tokubetsu. Instead of providing one line definitions of these terms, he devotes a few pages to each term, explaining in detail some of their nuances. He then does the same for Sake ingredients such as water and yeast, as well as touching on warmed Sake and regionality. Within each fascinating chapter, you may find something about the history of the topic, as well as insider information about the current status of the Sake industry. In addition, in each chapter, John recommends a specific Sake which he feels well illustrates the topic of that chapter. These Sakes should mostly be available in the U.S. In the next section, How The Industry Really Works, John discusses some specifics about the Sake industry, such as the role of women in breweries, Sake pricing, rice milling and Sake awards. These are generally issues which are rarely written about, so this is an especially compelling section. You'll learn compelling facts such as less than half the Sake breweries are reasonably profitable, and almost 90% of those breweries are family owned. These are some of the most interesting chapters in the book as give people a closer look into the Japanese Sake industry. In addition, this section has chapters on what glassware to use with Sake, as well as pairing Sake with food, and both chapters are informative and enlightening. The final section,The Brewer's Art Revealed, is the briefest of the three, with only three chapters on the art of Sake brewing. They discuss koji making (basically a mold which turns starch into yeast), the Toji (the master Sake brewer) and brewing different grades of Sake. These are also intriguing chapters, giving you a better idea of the difficulties and complexities of Sake brewing. The importance of koji, the duties of a toji, brewing guilds, and the seasonal aspect of brewing. So many cool and geeky topics. There are actually a few brief and informative chapters at the end of the book, separate from the three main sections. First, there is Developing Your Sake-Tasting Ability, with advice on how to taste Sake in a more professional manner, honing your tasting ability, which is known as kikizake-noryoku. It isn't necessary to go this far in your Sake tasting, but it is good that the information is there if you want it. It might lead you to a deeper appreciation of this wondrous brew. Next, there is Expanding Your Knowledge, some advice on gaining more Sake knowledge. Finally, there is a Glossary with definitions of many Sake terms. Readers will appreciate that though John has plenty of Sake opinions and preferences, he doesn't try to impose them on anyone else. There is no pretension here. He simply wants people to taste Sake and develop their own preferences. Overall, this is an informative and fascinating Sake book which I highly recommend. It fills a needed niche for a Sake book that goes beyond the basics, but still is approachable by even the casual reader or newbie to Sake. Even those knowledgeable to Sake are likely to learn at least a few things from this book. Buy this book and read it while sipping a glass of Sake. Kanpai! Which country is #1 in beef consumption? You might suspect that it is Argentina, where the asado, essentially barbecued meat, is the national dish. I've visited Argentina and had the pleasure to savor juicy and flavorful asado beef and other meats. I can understand their great affection for grilled meats. A few years ago, you would be correct in thinking that Argentina consumed more beef, per capita, than any other country. However, they have recently been displaced by another South American country, Uruguay. Tucked away in the southeastern region of South America, surrounded by Argentina, Brazil and the Atlantic Ocean, the small country of Uruguay has only about 3.3 million people, which is less than the population of Greater Boston. Around 1603, cattle were first introduced to the country by Hernando Arias de Saavedra, the Spanish Governor of Buenos Aires. Today, there are approximately 12 million cattle in the country, nearly 4 for each person. Almost 80% of their beef is exported, to more than 80 countries, and they are starting to make their mark in the U.S.
Back in 1956, the people of Argentina were consuming around 222 pounds of beef per capita but that has now decreased to around 129 pounds, a drastic reduction of nearly 100 pounds. Uruguay has now taken first place, consuming about 132 pounds of beef per capita. In comparison, U.S. beef consumption is only about 58 pounds, less than half what Uruguayans consume. Do Uruguayans know something that we do not? Back in February, at the Boston Wine Expo, I had the opportunity to sample some Uruguayan beef from Del Terruño, and I was impressed enough that it was one of my top three food finds at the Expo. A couple weeks ago, Del Terruño sent me a sample tenderloin so that I could cook it myself and get a better sense of their beef's taste. As you can see from the photos, I ended up grilling the tenderloin. Del Terruño, which means "from my small corner of the earth," sells free range, grass fed beef from Uruguay. The company has been around for about 5-6 years, and have been concentrating their sales efforts in the northeast region of the U.S., especially New England. The company derives their product from 8 cattle ranches, and the company also includes cooperative land owners, breeders, scientists, technology specialists and more. They are doing more than just selling beef, but are trying to do so in a more ecologically responsible and traceable manner. The cattle, Hereford and Aberdeen Angus breeds, are raised in open fields, each animal possessing over 3 acres where they can graze. They eat only grass, and are not fed corn or any grain at any time. This is especially important to people who wish to avoid consuming cattle which have eaten GMO corn. The area where the ranches are located have relatively mild temperatures year round. No antibiotics, hormones, or steroids are ever used. The cattle are generally slaughtered when they are 18-36 months old. The ranches adhere to responsible environmental practices and the beef is intended to be as natural as possible. It is also important to know that the beef has excellent traceability, and each package possesses the information to track it back to the original animal. This grass fed beef is lower in fat than grain fed beef, and thus also has less calories. The fat that is on the grass fed beef is also located more on the outside, instead of the interior marbling you find in grain fed beef. In addition, it is high in beta-carotene and antioxidants, and possesses more beneficial Omega-3 fatty acids than grain fed beef. This all sounds great but what about its taste, which is always the ultimate test. We cut the tenderloin into small steaks, seasoning it with some basic spices that included a wine infused salt, and grilled it until it was medium rare. First, this beef was certainly tender, and you could have cut it with a butter knife. Second, it had a mild beefy flavor with a bit of gaminess, which I found appealing. It actually tasted less gamey than most other grass fed beef I have tasted. My family loved this beef, and it didn't last long once it was taken off the grill. I enjoyed the beef at least as much as I did at the Expo, and I believe any meat-lover would savor this beef too. As grilling season has begun, Del Terruño would make for an excellent choice. With the beef, I drank a wine from Macedonia, the Tikves "Special Selection" Vranec. This worked out to be an excellent pairing as the wine wasn't too tannic, and had some spicy and earthy notes which complemented the beef. The usual advice in wine pairing is that food from a region pairs well with the wines of that region. That might leave you to believe that the Del Terruño beef would pair well with Uruguayan Tannat, however I think that Tannat is often too tannic for this leaner grass fed beef. I would recommend pairing it with red wines that are less tannic than Tannat, which still gives you plenty of choices, from Spanish Tempranillo to French Rhône, from Oregon Pinot Noir to Italian Chianti Classico. As for an out-of-the-box pairing, you could even drink Sake with this beef. A richer Junmai Sake, or maybe a Kimoto/Yamahai-style Sake, would go well with this Uruguayan beef. Some people dislike grass fed beef because of its gamey taste. Though the Del Terruño only had a minor gamey taste, you can still tone down that gaminess with Sake. One of the benefits of Sake is that it contains amino acids which help to mute the gamey taste of meat, making it more palatable to some people. The beef will also gain this benefit if you first marinate it in some Sake. Del Terruño is mainly available in Massachusetts, and their website lists the locations, restaurants and stores, where it can be obtained. For example, it is served at Taranta Restaurant, in the North End, or you can purchase it at Marty's in Newton. Within the next few months, they are also updating their website and you will then be able to order their beef online, making it more accessible to all. The beef is available in tenderloin, ribeye, strip and ground beef, priced at the mid-range for grass fed beef. Yes, that means it is generally more expensive than grain fed beef, but you have to balance the benefits from grass fed beef. I believe it is worth the additional cost. Have you tasted Del Terruño beef? What do you think about its taste? And what wine did you pair it with? “The food media as a whole is generally lazy,” remarked Joshua Ozersky, a food writer for Esquire and others and who is no fan of cupcakes. “There’s very few people in the food media that really have their own tastes and trust their own tastes. Generally most of them are followers. That’s why the food industry is dominated by trends. If you call something a trend, especially if you’re an editor, then it artificially becomes that. . . . There’s a group-think aspect." I have to agree that there is a significant portion of food writers who are lazy, choosing to write mostly about current trends rather than spending the time to write something more original. How many times do you really need to read another cupcake or cronut story? Put yourself in the place of the reader and ask yourself if you want to read another cupcake or cronut article. Do you find it exciting to read about the newest place selling their version of cronuts? When a new trend arrives, many food writers race to write about it, though often their stories are little different from the dozens of other stories out there. They think that is what their readers want to know about, despite the fact those readers have seen similar articles in many other places. I could even understand if the writers found a special and unique angle on these trends, but that is so rarely the case. These food writers take the easy route, penning shallow articles which are eminently forgettable. We need to see more food writers taking the time to research more unique stories, to write about matters that few other people are writing about. That applies to other writers as well, such as wine writers. Stop copying the same, tired old story ideas and trends that everyone else is writing about. Dare to be more original, to pioneer a path that few have traveled before. Yes, it will take more time and effort to walk this road, but ultimately it is more fulfilling, and will make your work more memorable. Rather than write another cupcake story, try penning an article about Peruvian restaurants. Instead of discussing the newest cronut incarnation, consider writing a post about the benefits of eating rabbit. There are tons of food and wine topics out there which are worthy of coverage, and which few writers have addressed. Leave the newest trend for some lazy writer, whose article will be read and forgotten by the next day. Compose something more original which people may read and then remember for some time to come. Will you step forward and try to become a better writer? 1) O wonderful Sherry! I am a huge lover of Sherry and you can check out my over 25 posts about this wonderful fortified wine. International Sherry Week is coming up, from June 2-8, and it will be a celebration of all things Sherry. Locally, Merrill & Co. will be holding some Sherry events though the specifics have not yet been set. Steven Alexander of De Maison Selections will lead a discussion of the Sherries at this dinner. Samples of selected sherries will be offered to diners, based on their menu choice! Sherry Flights for only $15. A new one each day, at the bar only. 2) “This seemed like a fun, engaging and delicious way to open the door to getting people to try something new. I like it better than lamb and I think it’s on its way to becoming a more mainstream meat,” said Rokeya Chowdhury, co-owner of Shanti restaurant in Dorchester. On Tuesday, June 17, at 7pm, Shanti and Executive Chef Anand “Andy” Pokhrel will present a multi-course, goat-centric dinner opening eyes to this fast growing popular protein. Guests will be guided through the dinner with explanations of the dishes, as well as being on hand to answer questions. The price for the dinner is $40 per person (tax and gratuity not included) and reservations are highly recommended by calling (617) 929-3900. Orta's new beverage manager Chris Sweiger, formerly of Lydia Shires Scampo in Boston, has edited Orta's wine list to more closely match the restaurant's creative Italian menu. Wines from the Piemonte region, especially, now complement the cuisine. Toscana, Campagnia, Trentino, Marches, Abruzzo, Venezie and Alto Adige are also represented by the bottle and by the glass. Sustainable sushi. Aquaculture. Invasive Species. Entomophagy. Ecological Responsibility. Health & Nutrition. These are all important topics which have brought national attention to Miya's Sushi and Chef Bun Lai. That attention is well deserved, though Bun suspects that some of the news articles, such as about invasive species and insects, may not actually bring people to the restaurant. Or if they do, it is a very small section of consumers who care about such matters. After dining and chatting with the personable and humble Bun, I think a more basic and compelling story exists, one that should be inspirational to all of us and make everyone want to support Bun and his restaurant. I believe the main takeaway is that this is a story about one man doing his part to make the world a better place. Like a Japanese haiku, this story is both simple and profound, thought provoking and fascinating. When I was planning my recent trip to Long Island, I knew that I would be taking the ferry from New London, Connecticut. On my return trip, I planned on returning to New London on a Friday afternoon. I realized that Miya's Sushi, which is located in New Haven close to Yale University, was only about an hour drive from New London so I made reservations to dine there that Friday evening. Iy sounded much better than fighting rush hour traffic all the way home. I had chatted before with Bun on Twitter, and knew that his restaurant was known for sustainable sushi as well as creating dishes with insects. I had seen many positive reviews for Miya's and the menu & concept intrigued me. It turned out to be the right choice, a memorable dinner that fully lived up to my expectations. Miya's Sushi was established in 1982, the first sushi bar in New Haven, by Bun's mother, who you can still see working at the restaurant, and who was present the night I dined there. The restaurant is named after Bun's sister, and has remained relatively unchanged over all these years. You can dine outside at picnic tables, or inside in one of their two dining rooms. The main dining room, with a very casual vibe, has numerous tables and a sushi bar. The other dining room is long and narrow, perfect for large groups of people to dine together. There is no pretension here, merely a welcoming ambiance for diners of all types. About halfway through our dinner at Miya's, Bun arrived at the restaurant and sat down to join us. We talked about the restaurant, his philosophy, and some of the activities in which he participates. I found him to be a genuine person, down-to-earth, and extremely passionate. You can't help but like him. He truly is concerned with doing his part to make the world a better place, from helping those in his community to setting an example for others. Yet he remains humble, and that humility is definitely sincere. Miya's Sushi reflects Bun's philosophy, his concern for sustainability, nutrition, and community. He seeks to operate the restaurant in an "ecologically responsible manner." As such, he tries to ensure the food they serve is sustainable, though he made it clear that the restaurant is not 100% sustainable, which he believes is an impossible goal. As such, he simply tries to be as sustainable as possible. This has caused some issues with certain customers who think all sushi places should serve seafood such as tuna, salmon and eel. You currently won't find any of those three items at Miya's as Bun has issue with their sustainability, but there is plenty of excellent sushi available at the restaurant that you won't miss those few items. And Bun is realistic, knowing that you cannot please everyone. In the newest issue of Lucky Peach, there is an article discussing the commonality of certain seafood at sushi restaurants in the U.S. For example, 95% carry Tuna and 93% carry Salmon, placing Miyas's into a tiny minority. Yet only 2% of sushi restaurants carry Tilapia, making Miya's one of those rare few. Most of the restaurant's cuisine is sushi and their menu notes: "We use the technique of sushi as a medium to explore what it means to be human." For example, they like combining ingredients from disparate cultures "symbolizing what is possible when people of the world live in harmony with one another." I would also say that to Bun, being human entails being concerned about the health of the world, which is why sustainability is so important to him and the restaurant. The sushi is often intended to be nutritious and healthy, promoting a better quality of life for people. As for the staff at Miya's, diversity is very important to Bun and most of his cooks have been there for at least six years. Bun mentioned that one of the biggest challenges of sustainability is making it affordable, which is an important aspect to him. It is certainly true that sustainable food products often are more expensive, and that those with lower incomes are subsequently less likely to purchase such items. Bun wants Miya's Sushi to be affordable for most anyone and doesn't want it to become some high-end sushi place where only the wealthy can dine. Based on my experience there, I believe it is a very affordable destination and Bun is succeeding in this objective. With a mother who is a nutritionist and a father who is a doctor, Bun is also concerned about health and nutrition. He is physically fit, and is careful of what he eats. In addition, he also takes time out to help others, to provide them information to make their lives healthier and better. For example, he teaches about 60 nutrition and cooking classes each year to low income, diabetics, holding those classes in a parking lot in the neighborhood where those people live. He also provides deliveries, over a 20 week period, of fresh vegetables to low income families. He gives back to the community, promoting better health and nutrition, constantly considering how to make this education more effective. Bun owns some land on the shore, where he can forage and fish, and also owns a boat which he takes out for fishing trips. On his farmland, most everything is wild growth which Bun can collect and use at the restaurant. Bun sometimes also goes on foraging trips across the country, gathering whatever is available. Some of the restaurant ingredients couldn't be any fresher. And it all helps to keep costs down at the restaurant. Despite the importance of all of these matters, there is one final test that must be passed. Does the food at Miya's Sushi taste good? For if the food fails, then everything else is for naught. I am pleased to report that the food excels and that it is a worthy culinary destination. Our table was located right next to this cool chalk mural, though be warned that the chalk will rub off on your skin or clothes if you inadvertently brush against it. Once you sit down, you will find that the food menu is a small book, filled with information on the restaurant and some of Bun's thoughts concerning certain ingredients and dishes. 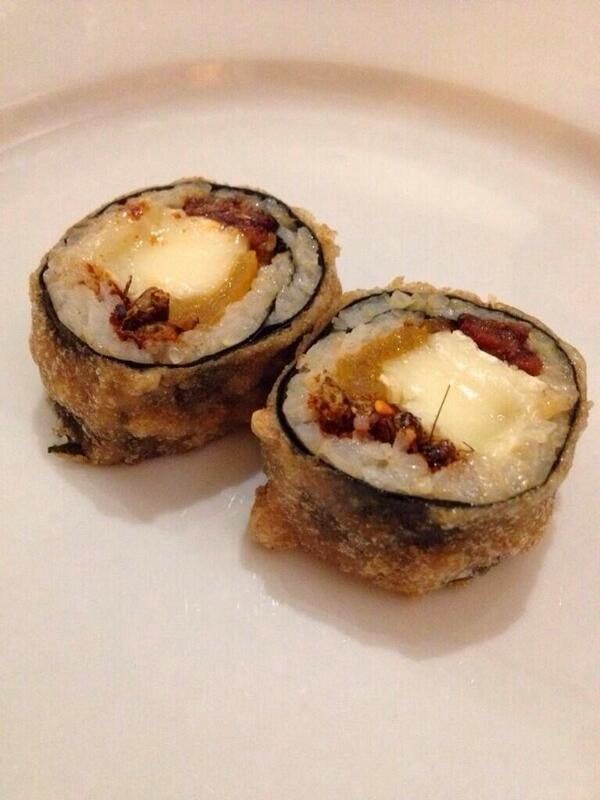 You might learn of the inspiration for a specific maki roll, or the reasons why he uses peanut butter. For a more leisurely perusal of the menu, you can check it out online. The menu is broken down in several categories, including Appetizers (9 choices at $3-$10), Nigiri (9 choices at $2-$4 a piece), Sashimi (6 choices at $5-$15), Main Course (4 choices, essentially tasting menus, at $22-$65), Rolls Of A Lifetime (34 choices at $5-$12), Sushi For The Masses (8 choices at $3-$5), and Dessert (2 choices at $5-$8). The Main Course choices provide some excellent values, such as the Blue Plate Especial, which delivers a 10 piece sample of Miya's classics, along with soup and salad, for only $22. Some of the more expensive Main Courses include Sake pairings. The Rolls Of A Lifetime entail a diverse and creative list of maki rolls, including many items you have probably never seen at any other sushi restaurant. And the Sushi For The Masses provides inexpensive sushi, though still good quality, which almost anyone can afford. Bun wants to ensure that Miya's remains affordable no matter the size of your wallet or pocketbook. The drinks menu is smaller than the food menu, but still contains interesting information about the drinks they serve. You can order one of their 4 Homemade Soda Pops ($5/glass, $12/pitcher) such as the Pickled Ginger Soda Pop, made with homemade maple syrup, or the Macha Soda Pop, made with green tea, lime and stevia. I tried both of these sodas and was pleased with their flavors, neither being overly sweet, and they were refreshing. They carry 3 Beers ($4-$6/glass, $9-$14/pitcher), including Pabst Blue Ribbon, which they describe as "classic swill", and two Connecticut brews, from Half Full Brewery and Thimble Island Brewery. They also stock 6 Wines ($8/glass, $18-$24/bottle), from California, France, Portugal and Chile. You can also BYOB for a corkage fee of $10 per 375ml bottle (so $20 for the usual sized wine bottle). To my delight, they have 7 Sake selections ($10/glass, $22/small bottle, $44/large bottle), and once again these reflect Bun's creativity streak. Apparently using Ozeki sake as the base, they create infused Sakes and are always experimenting with new flavors. I'll be discussing most of those infused Sake later in this post. I ordered the Sake Sampler ($44), which provides an ample selection of the various Sakes for 2 people. The Sampler is an excellent way, at a reasonable price, to try the Sake bounty at Miya's. To my dismay, they carry a Sake Bomb ($5), which is a glass of Pabst Blue Ribbon and a shot of their Chinese Firecracker Sake, though the shot glass is not placed above the tall glass of beer on a pair of chopsticks. It is more just a pairing of beer and Sake, though they suggest pouring the Sake into the glass of beer. The menu is amusing though, stating that "The brilliance in the original sake bomb is that it brings people together. The problem is that it tastes so bad." Though they do not carry spirits, they create 5 Cocktails ($7-$10/glass, $15-$24/pitcher) which are made with Sake and beer. I tasted a couple of these cocktails and will also discuss them later in this review. The Appetizers section includes some of the only non-sushi items, including soups, salads, and more. We began with the Tokyo Fro ($5), described as "tasty curls of crispy potatoes." This hefty mound of thin and crispy potato slices is topped by a tomato aioli and scallions. It is not a hot dish as you might expect, but it is still compelling and addictive, with an intriguing tomato flavor and a nice crunch. Despite the size of the dish, you are likely to devour all of it. We also began with our first Sake, the Emerald Witches' Lips, which is flavored with hand picked white pine needles. With a mild sweetness, the pine taste was noticeable, though mild, and appealing, reminding me of an herbal digestif. A nice start to our Sake sampler. One of the other appetizers we ordered was the Tatsugage ($5), ginger sesame fried chicken, which has to be one of the best examples of this dish I can remember eating in many years. The chicken was so tender and moist, with a crisp, flavorful and spicy hot coating. Many other examples of this dish I have tasted before tend to be dry, but this dish was far from the case. I was tempted to order another bowl of this chicken as I enjoyed it so much. Highly recommended. More Sake then began arriving, including some gently warmed Ozeki Sake. They understand the proper way to hear Sake. As for infused Sake, we first received the Dragon Lady Sake, which is made with ginger, lemongrass, and honey Sake. It had a prominent ginger flavor, with a hint of sweetness, and made for a good palate cleanser. The flavors were well balanced, which was a common element of all of their infused Sakes. The Chinese Firecracker Sake is a blend of home grown hot chili peppers, lemons, limes, citron, lemongrass, and honey. It was one of my favorite Sakes, a complex and intriguing blend of citrus and underlying heat. The mild sweetness helped to balance the spiciness, and the citrus provided some nice acidity. I brought a bottle of this Sake home with me and shared it with some of my wine loving friends, and it was a big hit. We also got to try one of their new experiments, a Pineapple & Sumac Berry Sake, which I thought was a winner. Pineapple and Sake made for an excellent combination. They also serve Buffalo nigiri, which I would have ordered, but it was not available that evening. The rice they use is an intriguing brown rice-centered mixture with quinoa, amaranth, oat grains and flax seed. In addition, it does not contain any sugar, which is commonly used in sushi rice in most other restaurants. I think this rice mixture added some nuttiness to the nigiri, and it will appeal to almost any sushi lover. Don't worry about it being too grainy or tough. It has a pleasant taste and texture. All of the nigiri seemed fresh, and it was all tender and tasty. The Smelt was enhanced by its flavorful sauce and the Scallop nearly melted in my mouth. I would recommend all of the different nigiri I tried and I don't think you will miss the fact that they don't serve tuna or salmon. The nigiri is also served with homemade pickled ginger that is made with maple syrup, giving some sweetness to the usual pungent ginger. The Best Crunchy Roll Ever is made from scallops, crispy fava bean tempura seasoned with home grown chilis, avocado and Iranian ghormeh sabze. I don't think I have ever had ghormeh sabze before, which is a kind of herb stew, and have never seen sushi made with it either. The roll was a nice mix of creamy and crunchy, with an interesting taste of herbs and spices. The ghormeh sabze worked very well in this dish. Our next Sake was one which our server stated was one of their least popular, the Ultraviolet Kisses Sake. It is made to be ocean-salty, with homegrown red aged shiso and sour plum. The idea of this Sake is to reflect the problem that the oceans have seen a 30% increase in acidity due to the activity of man. This Sake has a ph of 8.179, the same the oceans had before the increase, and it also has the same salinity content of the South China Sea. I enjoyed this Sake, thinking that it was like an oyster in a glass, a briny burst of flavor with a mild sweetness underlying the salinity. I understand why many don't like this Sake as much, as the brininess can be off putting, but others like me will love the taste. We received a couple of Cocktails, including the Kama Sutra (made from fresh pureed berries, Sake and beer) and the Korean Hong Kee Punch (made with fresh watermelon Sake, beer and splash of Chinese Firecracker Sake). The beer is noticeable in both cocktails, and I preferred the Hong Kee as I like the watermelon and hint of spiciness. If you enjoy beer, these cocktails will probably appeal to you. The Baked Sweet Potato Roll ($3) lacks the crunchiness of the usual Tempura Sweet Potato rolls you find at many other sushi joints. Instead, you get a soft and creamy treat, with the sweetness of the potato. A nice change of pace. Entomophagy is basically the eating of insects as food, and it is seen as an extremely sustainable option, though many people, especially in the U.S., possess a psychological barrier against eating insects. It is hard enough to get people to eat a sustainable choice like rabbit, never mind to get them to eat bugs like crickets and spiders. However, there are several organizations and companies which are trying to promote eating insects, and it is something that bears further examination. As Bun is an advocate of entomophagy, Miya's Sushi carries a couple items that use insects. I recommend that you open your mind and give those insect dishes a try before dismissing them, and you might find yourself becoming a convert. 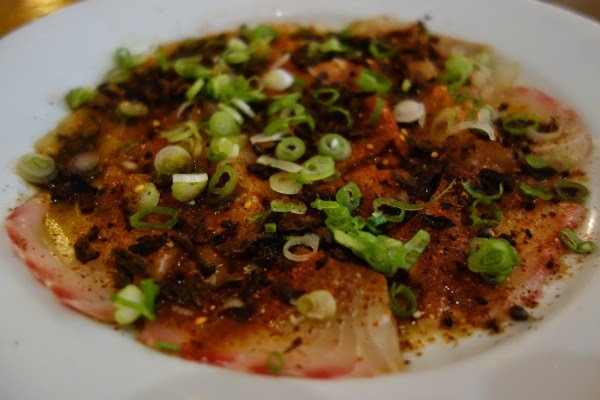 I was willing to taste the insect dishes, starting with the Nine Spice Sashimi ($10), which is made with a sustainable fish and is topped by a spicy citrus soy sauce with green onions. Our dish contained Mozambique Tilapia grown by students of the Bridgeport Aquaculture School. Bun uses Tilapia, in part, because it is an ancient fish of African origin, and may be the oldest farm raised fish in the world, having been farmed by the Egyptians. One caveat is that you need to eat this dish in a timely fashion, or it will tend to become ceviche due to the citrus. For an additional $5, you can top this dish with spicy, crispy, black soldier fly larvae, which I chose to do. They raise the larvae themselves and all it does is add a crunchy texture, and maybe a little nuttiness, to the dish. Unless you knew what was on the dish, you wouldn't suspect the small, black items were larvae. There is also plenty of thin sliced, and silky smooth, tilapia, with an appealing blend of citrus and spices, with a mild heat. Another highly recommended dish, and you definitely should go with the larvae. The only other insect dish on the menu that evening was the Crickleberry Brie Roll (2 pieces for $5), which is made from crickets, strawberries and Brie. The crickets are more noticeable in this roll, as you can see the legs/antennae sticking out, but that shouldn't be an obstacle to you. The roll is crunchy and creamy, with hints of red fruit and a slight nutty taste. I very much enjoyed this roll and would recommend it as well. In the book Edible, the author Daniella Martin says, "Crickets are kind of the chicken of the edible insect world." I was a bit hesitant about eating jellyfish sushi, concerned that it might have an unappealing gelatinous texture, but I tried it anyways. The Cannonball Jellyfish Nigiri ($3/piece) is topped by a spicy roasted sesame marinade. This jellyfish, which is also known as the Cabbage Head Jellyfish, is fished in the waters off Georgia (and Cannonball is a more appetizing name). I found that this jellyfish had more of a texture like a gummy bear, a springiness which wasn't actually gelatinous. And with the marinade, it was also delicious, with a compelling marinade, and something I would order again. I would also seek out other dishes made from Cannonball Jellyfish. Another Sake came to our table, the Water of Life, which is made with honey sweetened ginseng that was wild foraged in West Virginia. This was one of the sweetest of the Sakes, but balanced with an intriguing herbal component. Chef Bun is also a proponent of eating invasive species, those plants and animals which often are introduced into a new community, sometimes inadvertently, and which then cause damage to the ecology. By eating invasive species, we can help protect our environment. For example, lionfish are one of the more well known invasive fishes, and Bun serves it at Miya's when available. Unfortunately, they didn't have any the evening I dined there. Hopefully they will the next time I visit. The Kanibaba ($12) uses another invasive species, the Asian shore crab, which was gathered on the Connecticut shore. The dish also is made with Maryland blue crab meat, stuffed in potato skin infused with Asian shore crab stock, and topped with Jersey cow's milk cheese and a lemon dill sauce. This is another of Bun's well balanced dishes, a nice blend of crunchiness and creaminess, with tasty spices. I like the presentation of this dish too, as it does seem to resemble a cool sea scene. Returning to a couple appetizers, we enjoyed the Salad Days ($5), a large plate of greens tossed with a delicious and light wild ramp and basil dressing. We also enjoyed the Pumpkin Miso Soup ($3), made with slow roasted pumpkins, sweet potato, and acorn squash. With a bisque-like texture, the soup was full of flavor, with hints of sweetness, nuttiness and a touch of smokiness. Bun was apparently hungry, devouring, on his own, two salads and three bowls of soup. The final couple of items we ate included the Wabisabi (4 pieces/$10), a roll of kimchee seared arctic char wrapped in wild foraged pickled grape leaves. The grape leaves provided a leafy texture to the arctic char, which had an intriguing fermented taste. Lots of umami there. The Voompa (4 pieces/$10) is made from spicy crunchy eggplant, vegan cheese, avocado, home grown chilis, and Iranian ghormeh sabze. Another maki roll balancing crunchiness and creaminess. It seems that Bun likes creating rolls with different textures, and he succeeds in balancing them well. After all of this food, I didn't have any room remaining for dessert so I will have to try it on my next visit. Chef Bun Lai was a gracious host, and my experience at Miya's Sushi was memorable, delicious and enlightening. They offer creative cuisine which is sustainable, affordable, and tasty. Their drinks menu, especially the infused Sakes, complement the food as well as showcase more creativity. I have great respect for Bun, and all that he does to make the world a better place. His passion, dedication and devotion are inspiring. Miya's Sushi receives my highest recommendation and as summer approaches, I strongly urge my readers to make Miya's one of their vacation destinations. "Seventeenth-century settlers and fishermen fed lobsters to hogs and servants, pitch-forked them into fields as fertilizer, and used lobster flesh as bait to catch the more desirable striped bass, or to bait eelpots." As summer nears, people all over New England, including many tourists, will begin seeking out Lobster Rolls. At its most basic, it is a hot dog roll filled with chunks of lobster, however, you will find much diversity at the various restaurants which serve them. Maybe it has melted butter or mayonnaise, or maybe lettuce and celery. Everyone has their preference. In the near future though, lobster rolls might start being less common, as well as more expensive. In fact, all lobster dishes might meet this same fate. ".., lobster was redefined as marketable and targeted intensively beginning around 1830." At the Seafood Expo North America (SENA), I attended a special session presented by the Maine Lobster Marketing Collaborative on Maine Lobster from Trap to Table. One of the main panelists was Carl Wilson, the lead Lobster Biologist at the Maine Department of Marine Resources, and he stated that for about the last thirty years, lobster landings in Maine have been increasing, after about fifty years of stable numbers. The warming of the waters has contributed to a boom in the lobster population, and landings have essentially doubled in the last 5-7 years. For Maine, the lobster industry is vital, with about 4,500 active lobstermen and 2 million lobster traps. and occupies 70% of the value of all Maine fisheries. "The first sign of decline came in 1812, when voters in Provincetown, Massachusetts, alarmed by the depletion of local stocks, convinced the state legislature to limit lobstering in those waters to Massachusetts residents." However, that could all be changing. A recent University of Maine survey, the American Lobster Settlement Index, covering 11 locations in the Gulf of Maine, seems to indicate that the population of baby lobsters has declined, less than 50% of what existed in 2007. The warming temperatures, which have led to an increased in landings, may also be partially responsible for this decline, though the reasons are probably multiple and still not fully understood. The Maine Department of Marine Resources though does not believe the decline is due to overfishing. Lobstermen might start seeing decreased landings as early as 2016. We must remember that this is more of a potential warning than a definitive danger. It is an area of potential concern which must be studied in greater detail, and steps will need to be taken to address the problem. We also need to more fully understand the reasons for the decline in baby lobsters, especially if it is not due to overfishing. This also presents an excellent cautionary tale, showing that even with record landings, matters can change fairly quickly if we are not alert to potential issues. "Nevertheless, conservation laws of every stripe were routinely ignored by Canadian and New England fishermen during the 1870s and 1880s, as lobster stocks continued to shrink." With seafood sustainability, we must be ever vigilant and cannot stop assessing and studying stock levels, even when it seems levels are highly positive. Seafood populations are subject to many variables, and not all of them are within our control. We must do our best to ensure their sustainability and future growth, which means constant vigilance. The battle for sustainability will never end, though we may win a number of smaller conflicts. "A generation of reckless harvesting during the middle of the nineteenth century had driven to its knees one of Maine’s most valuable fisheries,..."
Why do you enjoy beer and wine? And be honest. Check the beer and wine reviews that you find in magazines, newspapers, blogs, and other websites. Ask your friends and family. Speak to the staff at beer & wine stores. I bet the vast majority of them will describe the various flavors you find in those beverages. For example, they might describe the hoppy flavors of an IPA or the cherry tastes of a Chianti. Some will even rhapsodize with a lengthy litany of aromas and flavors they discern in these beverages, sometimes using descriptors which seem to make little sense to other drinkers. In all those descriptions though, one important element is usually omitted, possibly a legacy of our puritanical heritage. It is the dark secret of beer and wine consumption, that aspect we dare not speak aloud. However, it is a secret most of us share, and it makes little sense to conceal it. We shouldn't deny the reality of our drinking. Be honest. You can do it. We all know that you enjoy beer and wine because it contains alcohol. You like that apparent sense of euphoria provided by alcohol. You revel in how alcohol makes you feel, altering your perception. Frankly, you probably wouldn't be drinking beer and wine if it didn't include alcohol. When is the last time you drank a non-alcoholic beer or wine? How often do you consume non-alcoholic beer or wine? While reading beer and wine reviews, you might see a brief mention of the alcoholic content of that beverage but the reviewer won't discuss the effects of the alcohol. Some writers complain about high alcoholic wines but those same writers don't admit that they actually enjoy how alcohol makes them feel. Maybe we should talk about this subject more, to stop hiding it in the shadows. It is an important element of what we drink so there is no need to deny it. It probably doesn't seem like proper etiquette to discuss our enjoyment of the effects of alcohol. It seems more refined to discuss the various aromas and tastes rather than explore how the alcohol affected us. If we discuss our enjoyment of the effects of alcohol, we might be perceived by others as having a problem. Those who actually discuss such effects, like Anthony Bourdain, are usually seen as rebels and bad boys. However, as so many people actually enjoy the effects of alcohol, it should be the norm to openly discuss it. It shouldn't be perceived as bad. If the alcohol didn't matter, then non-alcoholic beer and wine would be hugely popular. And though the popularity of non-alcoholic beer has grown over the last five years, its popularity is greatest in regions like the Middle East. In the U.S., nonalcoholic beer and wine is still a tiny niche market. So step up and admit the truth, that you drink wine and beer, in part, because you like the effects of alcohol. It certainly is not the only reason we enjoy these beverages, but it plays a significant factor. And maybe by discussing it, we can better avoid problems with the abuse of alcohol. As I reported previously, AKA Bistro, one of my favorite suburban restaurants reopened last week, after being closed for a few months due a massive flood. Located in Lincoln, AKA Bistro serves both French bistro fare and Japanese cuisine and their menu has seen some changes. You still can find old favorites like their Homemade Traditional Miso Soup and Moules Frites, but you will also find new dishes that might become new favorites. I should also mention that Chef/Co-Owner Chris Chung is now responsible for 100% of what's served. Earlier this week, I stopped by for lunch, to see the new renovations and check out some of the new menu items. The restaurant itself looks largely the same, with some changes to the kitchen area. You can sit inside, or on the exterior patio. As I perused the menu, there were plenty of dishes I was interested in trying, so I definitely need to return to check out more. I began with one of the new Appetizers, the Spicy Steamed Clams In A Jar ($10), which is a large mason jar with small and plump steamed clams in a savory broth with basil, lemongrass, Thai chile and lime. The tender clams were cooked perfectly, and the broth was compelling, with lots of flavor and a hint of almost sweetness. The broth in their Mussels dish is one of my favorites, and the the broth with their clams, though different, is equally as good. They even give you a straw so you can drink up the broth once the clams are gone. My preference though is to dip bread into the broth. This is a winner of a new dish! As an Entree, I chose the Sautéed Sliced Angus Beef Bowl ($16), with kabayaki carrot and onion on top of Japanese rice. There was plenty of tender beef, and the carrots added a nice, sweet crunch to the dish. This is intended to be one of their more healthy new dishes, and it makes a good selection. AKA Bistro has returned, and its food is as delicious as ever, with plenty of new and interesting dishes. I certainly will be returning, for lunch, dinner and brunch, but I have faith the restaurant is not going to disappoint. I strongly urge my readers to check it out. 1) Owner & Chef Brian Poe is springing into the season with the launch of new menu items at The Tip Tap Room in Beacon Hill. Chef Poe’s updated menu incorporates the peak flavors of the season and a new twist to his signature “tips” and “taps” concept. To cater to diners with a gluten intolerance, Chef Poe also has created a dedicated menu full of gluten-free selections which are annotated below (GF). For appetizers, Chef Poe now will serve up a quartet of new options including: Grilled Avocado (with lobster in black pepper lavender crème fraiche - $13.95; GF); Fried Calamari (beef tendon, licorice glacé, spring vegetables, preserved lemon yogurt - $12.95); Grilled Georgia Shrimp (roasted hazelnuts, shaved button mushrooms, broken egg & pine vinaigrette, mustard blossoms - $16.95; GF); and, Burratta (vadouvan crusted, pickled green tomatoes, arugula blossoms, mustard oil, white balsamic vinegar, miner’s lettuce -$12.95). Moving onto the next course, there are two new gourmet salads and three new entrée options available in addition to many selections of “tips.” Highlights include: Chicken & Arugula Salad (sumac-honey ricotta, muscat grape, grilled radishes, green almond, butermilk-espellette dressing - $12.95; GF); Poached Pear Salad (vanilla & orange poached Bosc pears, stone ground mustard sage vinaigrette, raisins, toasted walnuts, Bardwell Farm Pawlet cheese - $11.95; GF); Cod (miso-marinated with sweet and sour pickled beach mushrooms, daikon & scallions in a coconut and ginger broth - $23.95); Buttermilk Chive Gnocchi (shallot cream, fried bacalao, chickpeas, red jalapeño puree, parmigiano reggiano - $21.95); and, Wagyu Flank Steak (sweet peas & seven bacon risotto, fava bean, mushroom & seven bacon salsa, wild rapini, cabernet lemon reduction - $26.95). Other soup and side newcomers include: Spring Pea Soup (buttermilk, vanilla infused pearl onions, sorrel, pork belly crouton - $12.95); Applewood Smoked Baby Carrots (cognac, goat butter, grilled blood orange - $6.95; GF); Roasted Potatoes & Spring Onion (sweet onion puree, greens - $6.95; GF); Grilled California Asparagus (parmesan emulsion, 7 bacons, candied lemon - $6.95; GF); and, Wild Mushrooms & Fiddlehead Ferns (soy-honey - $6.95). Available at lunch and dinner, Chef Poe will continue to serve up his seven signature “tips” selections with refreshed accompaniments, his nightly rotating wild game specials and other Tip Tap classics. 2) Heritage Museums & Gardens unveils this season’s newest exhibit – David Rogers’ Big Bugs on Saturday, May 31, from 10am-6pm. Sculptor David Rogers creates insects such as 25-foot long ants and dragonflies with 17-foot wingspans, using various combinations of whole trees, cut green saplings, dry branches, and other forest materials. All wood is found dead or harvested sustainably. The inherent uniqueness of these materials, their different shapes, colors and textures provide these sculptures with their character, definition and a sense of motion. The effect is a role reversal of dimension and perception. The Big Bugs at Heritage will include: three ants, a dragonfly and a damselfly, an assassin bug, a praying mantis, a spider on a web, a ladybug and a Daddy Longlegs, all placed in interesting landscape settings throughout the grounds. · Meet the Artist: 10:30 am, 3 pm, 4 pm. Meet David Rogers, and learn how he created the sculptures in the exhibit. · Bug Ball: 12 pm-4 pm. Create a bug mask, use costume elements and puppets, mimic insect moves, and join the dance party on the Hidden Hollow stage. · Crafty Critters: 10 am-2 pm. Make your own interesting insects to take home. · Insect Exploration: 10 am-6 pm. Learn how insects use camouflage to survive and thrive, see insectivorous plants in action, discover mounted displays of bugs that live at Heritage, and more as you explore an insect theme through various activities in Hidden Hollow. · Insect Safari: 10 am-6 pm. Visitors will be challenged to visit each of the ten sculptures and will learn fun facts about the insects depicted at each. David Rogers’ Big Bugs opens on May 31and runs until October 26, 2014. 3) After ten years of delighting diners with their modern, farm-driven cuisine at their restaurant Farmstead, Inc. in Providence, Rhode Island, Chef and Owners Matt and Kate Jennings are returning to their hometown of Boston and planning a new restaurant in the city where they grew up, met and began their culinary careers. The Jennings have set their homecoming sights on the new Radian building at 120 Kingston Street where they will open Townsman in late 2014. Defined as “native to a place,” Townsman will showcase Matt & Kate’s personal approach to dining and hospitality in their new, but familiar community of Downtown Boston. This is certainly big news, a great win for Boston and a loss for Rhode Island. I eagerly look forward to the debut of Townsman later this years. 4) The Fruit Center in Hingham loves outdoor grilling season, and so do professional cooks. So, beginning next month, some of the regions most beloved restaurant chefs will strut their stuff with a series of al fresco grilling demonstrations in Fruit Centers Water Street parking lot every other Saturday, rain or shine, from 11:30 AM to 1 PM during June and July. These culinary events are open to all shoppers and are free of charge. 5) On June 4, at 6:30pm, Legal Sea Foods in Framingham will host a wine dinner with Fine Estates from Spain. Importer and merchant, Jorge Ordoñez, imports Spain's largest wine portfolio to America and provides a balanced spectrum of what he believes to be the best Spanish wines available in America. Ordóñez takes great pride in discovering, reintroducing and developing a wide array of varietals. Legal Sea Foods will team up with Ordóñez to host an exclusive four-plus-course dinner fwith his selections from the Fine Estates from Spain vine. Some wine lovers possess a misconception about the wines of Sicily, believing that they are all essentially the same, that Sicily possesses a singular terroir. However, why should that be the case? Sicily, which covers nearly 10,000 square miles, is the largest island in the Mediterranean Sea. It is roughly equivalent in size to the Champagne region of France, and is about four times larger than the combined size of Sonoma and Napa counties. Its size alone should be a significant clue that Sicily likely possesses multiple terroirs, a land with a variety of soil types and microclimates. That was made even more clear at a recent media tasting of some Sicilian wines produced by Planeta Wines. Back in October 2012, I attended a previous Planeta tasting, finding much to enjoy in their wines produced from indigenous Italian grapes, from Carricante to Nerelo Mascelese. Please see that post for some basic information about Planeta. The recent tasting was at a luncheon held at Meritage Restaurant, Chef Daniel Bruce's famed restaurant at the Boston Harbor Hotel. It happened to be a beautiful and sunny day, so we had a great view of Boston harbor during our lunch. Planeta Wines was represented by three women, including Francesca Planeta (one of the owners), Patricia Toth (winemaker) and Penny Murray (export director). They also chose to highlight wines from two different wineries, each from a different DOC, Noto and Vittoria. Though they own 6 wine estates, each is still a small, artisan operation. Though some Planeta wines are now available, in September, they will be launching a full line of their new wines in the U.S.
Francesca Planeta, who was both personable and knowledgeable, gave an introductory speech about Planeta, stating that they desire to create wines that represent diversity and terroir. She wanted to stress that not all of Sicily is the same, that there are multiple terroirs creating different wines. Sicily also has over 20 local grape varieties, which adds to the diversity. Francesca sat at my table during lunch so she spoke more in depth about some of the terroir differences of the wines we were tasting. The DOCs of Noto and Vittoria each possesses a different terroir, with white calcareous soil common in Noto while Vittoria soil commonly has red sand. Both estates are also at low elevations. Their Noto estate covers about 60 hectares, and they primarily grow Nero d'Avola and Moscato Bianco. In Vittoria, they rebuilt a 100 year old winery, and primarily grow Nero d'Avola and Frappato. While enjoying some passed hors d'oeuvre, we sipped the first wine, the 2013 Planeta Moscato di Noto DOC ($21.99). This wine is made from 100% Moscato Bianco and it is fermented and aged in stainless steel. This is a dry wine, not the sweet Moscato that is so popular right now. It is very aromatic, with a complex blend of floral, citrus, vanilla and more. On the palate, it is crisp and full bodied, with an intriguing melange of flavors. A nice apertif. As we sat down for lunch, our first course was a Maine Lobster & Monkfish Brodetto, with a Saffron & Tomato Aioli Topped Grilled Crostini. The savory broth was tasty, and enhanced the sweet lobster meat and tender monkfish. A tasty way to start our meal. With this dish, we had three wines, including the 2013 Planeta Frappato DOC Vittoria ($21-$22), which won't be released in the U.S. until around September. I like the Frappato grape, and this example was impressive. It was a light bodied wine, with floral and red fruit aromas, and a light red color. On the palate, there was a delicious blend of red fruit, smokiness, mild spice and some minerality. It is an easy drinking wine with character, and paired well with seafood. Those who like Pinot Noir will probably also enjoy Frappato. The only DOCG, the highest level of appellation. in Sicily is currently Cerasuolo di Vittoria, a blend of Nero d'Avola and Frappato. The Italian term "cerasuolo" means "cherry red," reflective of the usual color of the wine. This wine can also qualify as Classico if it is aged at least 18 months. The 2011 Planeta Cerasuolo Di Vittoria DOCG ($23.99) is a blend of 60% Nero d'Avola and 40% Frappato. It was light bodied and fresh, with bright cherry and strawberry flavors, and smoky accents, with a hint of licorice. An easy drinking wine, it still possesses character and complexity. The 2011 Planeta Cerasuolo Di Vittoria Dorilli DOCG ($32.99) is a blend of 70% Nero d'Avola and 30% Frappato. The Dorilli estate, named after the Dorilli River, is located close to land which once was owned by the Planetas’ paternal grandmother. It is a Classico, and I found it more full bodied, though still with mild tannins. The flavors were more complex, with subdued red fruit, a spicy backbone and a lengthy,pleasing finish. An excellent wine which I strongly recommend. Last year, I tasted the 2010 and 2004 vintages of Planeta Cerasuolo, and the 2004 was superb, showing its potential for aging. Our main course was a combination of Slow Roasted Long Island Duck and Foie Gras Filled Ravioli, with Wild Rapini Greens and Melted Fennel. A superb dish, with such decadent ravioli and duck that was cooked perfectly. Delicate pasta, silky foie, tender duck. Chef Bruce knocked it out of the park with this dish. With the duck and ravioli, we drank the 2009 Planeta Santa Cecilia Nero d'Avola, DOC Noto, ($41.99), made from 100% Nero d'Avola. It was a more powerful wine, with moderate tannins, dark fruit flavors, a mild spiciness and a very long finish. Delicious and compelling, this was another excellent wine from Planeta. I previously tasted the 2005 and 2007 vintages, which gave me some indication of this wine's potential for aging. Dessert was a Contemporary Carrot Cake with Roasted Pineapples & Toasted Walnuts. If you look at the photo, you might wonder where the carrot cake is located. However, it is just below the hemisphere, which is composed of a creamy and sweet mix, which didn't taste like cream cheese in the least. It was sweet and creamy, and sat upon a moist carrot cake. This has to be the best carrot cake dish I have eaten in years. The walnuts and pineapple enhanced the dish, and I could easily have devoured another one. The final wine was the 2010 Planeta Passito Di Noto DOC, ($40.99/500ml), which is made from 100% Moscato Bianco. With a fine golden color, it presents an alluring aroma of dried fruit, honey and floral elements. On the palate, it possesses concentrated and complex flavors of citrus, melon, dried fruit and honey, with plenty of acidity which means it only presents a mild, balanced sweetness. A tasty way to end out lunch. Sicilian wines are starting to get the attention they deserve in the U.S. so you can expect to find them more readily available at your local wine shop. Remember that Sicily possesses multiple terroirs, and that you will find plenty of diversity in the wines of this large island. When seeking Sicilian wines, you definitely should check out the wines of Planeta, especially those which use Italian indigenous grapes. Though they own multiple estates, they still are more of an artisan producer, and are creating some compelling wines.